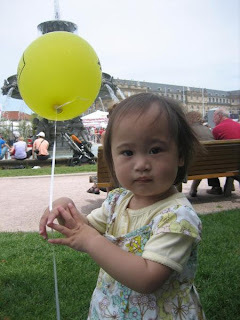 Just About Anything: Mommy Moments: Yellow! I love the color yellow and surprisingly, this is the theme for Mommy Moments this week. The day she reached one of her most-awaited milestones, she was wearing yellow. Can you tell what it is? 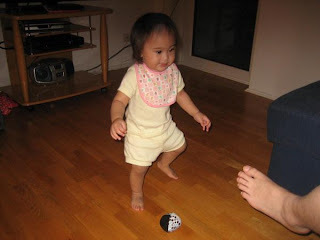 That's right: her first steps! (which, by the way is YELLOW) when she was just learning how. Her only YELLOW dress and her YELLOW balloon. It could not get more YELLOW-er than this! But no matter what color of clothes she wears, she always brightens up our moods and our day. She adds a little bit more sunshine since she came into our life and that is more than enough for us! You may find my Mommy Moments at Nostalgic Marveling, have a happy weekend! 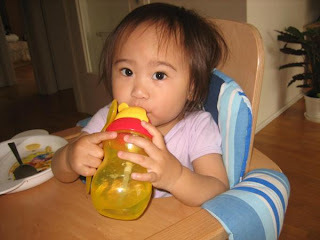 Sam is so cute...ganda ng pagka dilaw ng feeding bottle niya eh :-)! you're blessed with adorable angel. Sam is your sunchine, and sunshine is yellow, too! Thanks for sharing these very lovely and memorable pics!Mine is up, too, Mommy! you baby is so lovely with the yellow dress. She is cute little girl...happy mommy moments. Holding up your own drink was a celebrated milestone :) Cute dress Sam has there. yellow is such a happy color isnt it? :D im glad you joined us this week Marce! happy mommy moments! Tiger Woods: Debt Consolidation after Divorce? Girl Talk: Finger Food Is Always First! Should You Buy Bathroom Accessories Online? How Much Do You Know About SERP? Oh No, There's No Film!